Converts pierced earrings to clip by inserting post of the earring into the Converter and bending gently at a right angle. 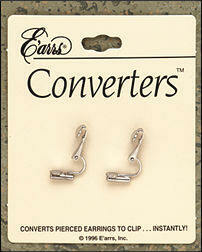 E'arrs® Converters™ are silver tone (not sterling silver) or gold tone (not gold or gold-filled). 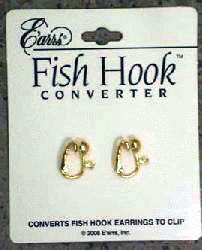 The package contains 1 pair of earring converters. 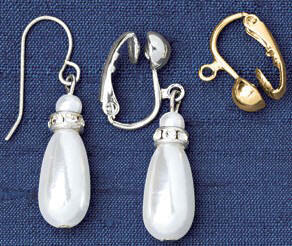 Converts pierced wire Frenchwire (fish-hook) earrings to non-pierced clip earrings by removing the earring dangle and attaching it to the converter. 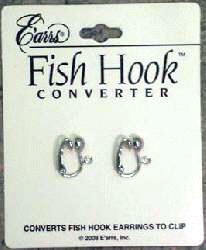 E'arrs® Fish Hook Converters™ are silver tone (not sterling silver) or gold tone (not gold or gold-filled). Made of an FDA Grade low density polyethylene, these post earring backs are perfect for people who are highly sensitive to metal. They are soft, flexible and very comfortable. They provide added earlobe support while wearing heavy earrings. The package contains 12 discs (6 pairs of earrings). Now available in clear! Made of an FDA Grade low density polyethylene, these post earring backs are perfect for people who are highly sensitive to metal. They are soft, flexible and very comfortable. 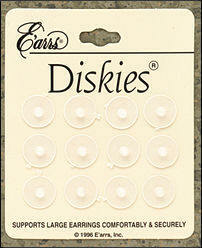 They provide added earlobe support while wearing heavy earrings.